Is it possible for a dish to have too much flavor and too little flavor at the same time? Well, I guess so. This "salad" was...horrible. I didn't like it when I first tried it after making it, and I didn't like it the next day either. The jalapeno added a strange heat that seemed almost as if it didn't belong in the dish. I usually like mint in Thai dishes, but this just did not do it for me. Maybe the recipe called for too much mint, but it was extremely overpowering. At the same time, the couscous was bland (maybe because I didn't add salt? ), and the spices almost seemed nonexistent. And 1 oz. of feta cheese per serving really isn't enough. Maybe more (or to taste) would have added that missing saltiness and extra flavor. 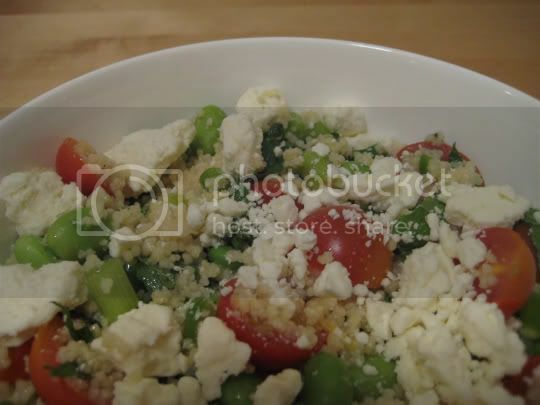 Still, I wouldn't want to rely purely on feta cheese to give my dish flavor. Eh, I just didn't get this one. Make again? Do you really need to know the answer to that one? I hate to even give this dish the 1-strawberry rating. Maybe it need some sort of salad dressing? An Italian or something? Some sort of liquid aside from the lemon juice. Ehh @ too much mint. You should try regular dehydrated couscous; re-hydrated with water, fresh lemon juice, cumin and coriander- both dried. No garlic, salt or jalapeno's (an odd choice, I must agree)! I like to keep it simple and add kidney beans, feta and cucumber, or rocket and feta if I can't be f****d. Always garnishing with olive oil. Yummmmmmmmmy.